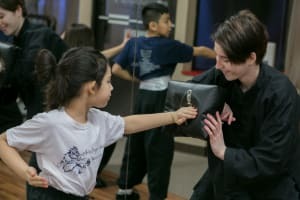 At the Blue Dragon School of Martial Arts, we want to make sure you and your child have the best experience possible and make sure your child gets what they need so that they can excel. We pre-evaluate every child’s skills to determine which program he or she will qualify for. This way you can be sure that your child is placed into the program that best fits their needs. We take the worry and uncertainty out of the equation. In our kids martial arts programs, we use specially designed evaluation planners and evaluation charts for each of the youth age groups. Our Little Dragons program is for ages 3-4 and 5-6. We want them to get exactly what they need most so we separate them according to the stages of development, and you can read more about that here. In our pre-evaluation process, your child will be scored on a scale of 1 to 5 based on how well he or she performs. The student must score and average of “3” in order to qualify for the group class; any score below a 3 would be considered a weak spot, and any score above a 3 would be considered a strength. Those students that do not qualify for the group class can either be placed on a private training program, if available, to help them build the necessary skills, or we can provide you with some homework suggestions and ask them to come back in 4 to 12 weeks, depending on the situation. Step 1: Set an appointment to have your child pre-evaluated. 1. Let us know the age of your child. All of our programs are age-specific and skill-specific to target each child's stage of development. 2. Provide contact information in case we miss connections. 3. Arrive 10-minutes prior to the appointment. 4. Please call should you have to re-schedule. 5. Look around BlueDragonKungFu.com for more information. We will run your child through 3 tasks per category. For those children that do not qualify, a private lesson circuit is an option, or we can provide some at-home assignments and have you bring your child back in 4 to 12-weeks. The pre-qualification process will not only help us determine whether the child will qualify for the group class, but it will also help us spot his/ her strengths and weaknesses which contribute to our approach with your child so that they can soon excel even in areas where they may currently be weak. We will then take your child through the pre-evaluation process by one of our highly trained instructors. Your child shows weakness in this area and needs special attention to ensure proper development. Your child shows some skill, but is slightly behind others his or her age. This area will need to be focused on in order for them to progress. Your child shows average skill compared to others his or her age. Your child shows strength in this skill compared to others his or her age. Your child shows exceptional strength compared to others his or her age and could possibly advance through the program at an accelerated pace. At the Blue Dragon, our goal is to clearly identify each child’s strengths and weaknesses and then translate how our program will target those skills in a results-driven curriculum. We want to make this a no-brainer decision for you once you see the obvious areas that your child can develop and our method for improving those skills. Once this process is complete, our program director will then go over your options. Ready to see this all in action? Fill out the "REQUEST MORE INFORMATION" form or call us directly at 201-385-3130 and we will get you and your child on your way!